Yesterday I went to the 2013 Cakeriffic Expo in Melbourne. 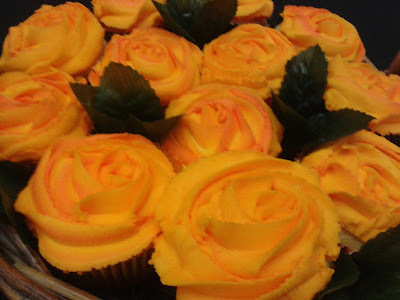 Although cake decorating is not my focus, I do love cupcake decorating. So when Karen at Lick The Bowl told me about it I just had to go along. If you are a lover of all things fondant than you will be in heaven at this expo! 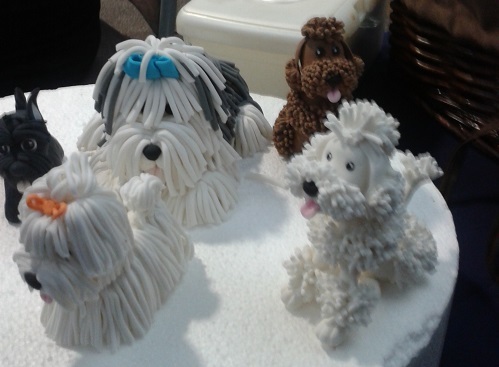 Not only were there a lot of cake decorating equipment suppliers and decorators themselves but there were some great demonstrations, such as 'How to make a bridge and groom' by Verusca Walker and fondant dogs by John Quai Hoi at Cake Delights. These little cuties are made completely out of fondant. John was the first demonstration that I saw, and I was just amazed at how easily he put together this grey and white shaggy dog. Starting from a simply fondant body, no more than shapes for his head, body and legs, he added clumps of hair bit by bit. He really did make it look easy! As fondant and I are not exactly friends (long story but let's just say that my attempt to make my fondant from scratch last year had me throwing it across the room), I was delighted to meet Simone from Amazing Cupcakes and Treats. We had a lovely chat about buttercream decorating and her beautiful cupcakes. She gave me hope that one day my roses will look better as she only started two years before, and is now surprised how easily she does them now! Treats. Simone will be demonstrating roses all weekend. 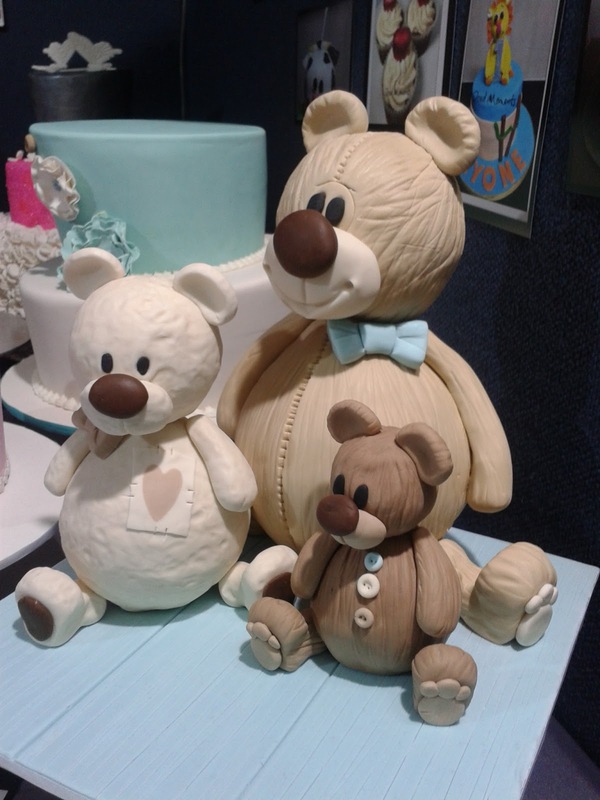 I think my favourite cake on display was this Teddy Bear cake by Iced Moments. It was just so, so cute - almost too cute to eat! And at the same time Amanda had made it look more like artwork than a cake itself. Teddy bear fondant cake by Iced Moments. 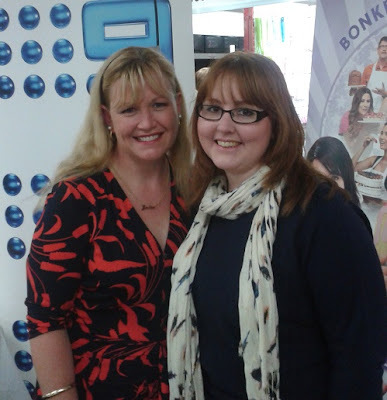 I will admit though the highlight of my day was meeting Julie from the Great Australian Bake Off. 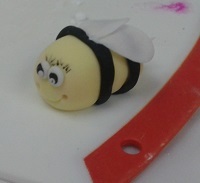 Not only was her fondant bee demonstration great, but she was an amazing speaker as well. She told us about her time on the show and how she was surprised when the tv ads came out that she was nicknamed "the commando". "I know I'm a bossy person," said Julie. "But it's just really interesting what aspects of your personality come out more when you meet new people - I didn't think I was that Bossy! But that was what character trait was picked up on the most during the show." What I found very interesting is when Julie told us how their technical bake offs work. They don't get any preparation time for these challenges, and almost have to rely on what they know or have baked before for it to work. "The recipes that we are given aren't full recipes - they are missing bits are more like basic directions ... measurements and even temperatures are even missing." The funniest thing was when she told us how the camera men on set were just in awe of everything they did. Most of them had never had anything to do with baking or decorating before so often they would be filming but also asking lots of questions about how contestants were doing things because they were just amazed at their skill. "They were ask us 'What are you doing there?' or 'What's that that you are adding? What does that do?' ... they were even asked to stop making too much noise on set!" At the Expo Julie demonstrated her cute little fondant bees. I loved her presentation style and how she didn't assume that everyone was a master decorator and really just explained things so well. Breaking it down step by step, I was actually really surprised how easy they were! If you're in Melbourne and would like to check out the expo yourself there is still one day left! You can buy tickets online or at the door. Simply visit www.cakeriffic.com for more information. Hi Steph, I just came across your blog. Thanks for all the kind comments about the Cakeriffic expo. I hope you'll be able to come along next year too - July 18th, 19th & 20th. Also I hope you've had a go at making those cute wee bees. - Shirley. Cakeriffic expo.